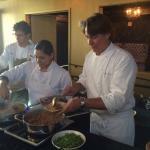 John Besh serves shrimp remoulade at the Only in Louisiana brunch. 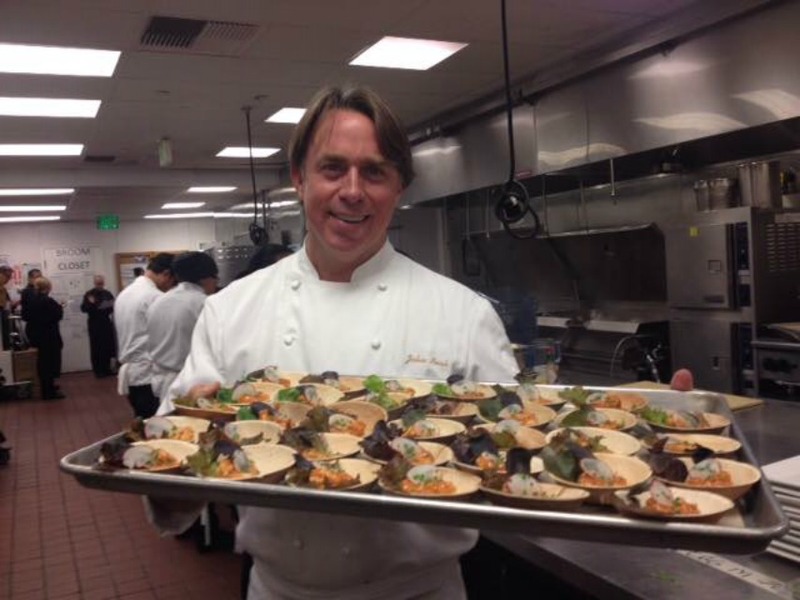 New Orleans chef/restaurant mogul John Besh has long been familiar with the L.A. food scene. 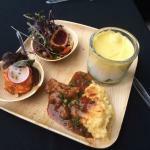 John Besh’s brunch menu included slow-cooked pork grillades, boiled shrimp remoulade, seared yellowfin tuna with a black-eyed pea salad, and eggs in a jar with crabmeat okra sardou. 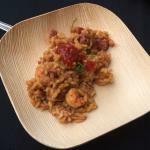 John Besh makes crawfish etouffee fried rice. 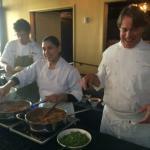 John Besh plates his crawfish etouffee fried rice. Besh’s crawfish etouffee fried rice is crispy and can be topped with sambal. So, yes, Besh, who made gumbo with jumbo Louisiana shrimp, Mangalista sausage gravy, and baked burrata grits at the Goin-hosted Alex’s Lemonade charity event in September, is tight with some of the true OGs of L.A. dining. But he’s also a man who is always looking for new inspiration. So on this L.A. trip, he took his chef Brian Landry on a tour of some of the city’s best seafood restaurants. Besh has a restaurant, Borgne, that he says is his equivalent of Son of a Gun. So he and Landry went to Son of a Gun and ended up eating most of the menu even though Besh didn’t call Vinny Dotolo in advance because he was worried about getting bombarded with food. In just a few days of eating, Besh also was dazzled by Connie & Ted’s and Chi Spacca, the latter of which isn’t exactly focused on seafood but shares a sensibility with the other restaurants he visited. Coming from Louisiana, Besh is inspired by L.A. because he’s often had barriers when he cooked. “When I make gumbo, it has to taste like my mom’s gumbo.” he says. So after Besh cooked brunch at the Conga Room for a party where Grammy-nominated Louisiana artists Ledisi, Magnolia Sisters, Jo El Sonnier, and Bonsoir, Catin performed, it was time for the chef to eat. And as good as his brunch food–which included standouts like crispy crawfish etouffee fried rice (the kind of riff that would fit right into Los Angeles’ dining scene) and slow-cooked pork grillades–was, he wasn’t in L.A. to eat his own food. So he got in his car and went across town to Manhattan Beach for some seafood at Fishing With Dynamite. This is The Best Gigantic Steak to Drop Large Dollars on in L.A.